IllinoisVENTURES, in partnership with the Office of Technology Management and on behalf of the UIC Chancellor's Innovation Fund, is pleased to announce the 2018 POC Awards Program. Selected proposals may receive funding of up to $200,000 over 2 phases of funding for research projects with commercial potential. The final award amount will be determined by the scope of work, divided into milestone according to input from the review committees. 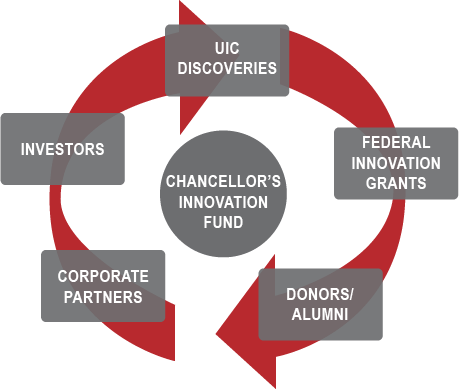 To be eligible for funding, projects must be based on a UIC invention that has been disclosed to the Office of Technology Management. To be eligible for Proof-of-Concept Funding, a proposal must be based on a technology disclosed with the Office of Technology Management (OTM). Forms and instructions on disclosing a technology can be found here: OTM Submit your idea. Any questions, please contact a tech manager. Edit icon Submit Your Idea!